For the past two decades, Kornfeld has been making art installations that examine modern iconography. His latest creation, “Ozymandias,’’ was completed in late May and sits on a prime patch of real estate outside at the DeCordova Museum and Sculpture Park. 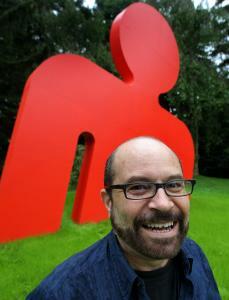 The 18-foot-tall sculpture is a great red slab that appears to be sinking into a swath of lawn. “Ozymandias’’ is shaped like a giant man - more precisely, the smooth-edged, cartoonish species of man that is plastered on countless bathroom doors around the world. He went home and cut a stencil of the classic female figure on the restroom door, with her triangular skirt and impossibly round skull. He spray painted it onto a canvas. Though he has since abandoned the two-dimensionality of paint in favor of the messy bulk of wood and paper and steel, his signature icon is still the same. He studied landscape architecture at the University of Oregon, and his first job out of college was an entry-level position with a firm called Sasaki Associates in Boston. He was assigned to work on 12 kilometers of Kuwait City’s coastline. Though he was never actually sent to Kuwait, Kornfeld watched in awe as the architects planned an artificial island scattered with parks and outdoor attractions. In a sense - whether consciously or subconsciously - this is the key trope in Kornfeld’s art: the push to differentiate the individual from a world full of icons and expectations. His first sculpture was a mosaic made of 4,000 wooden cubes, each emblazoned with a male or female figure that was warped in some way: an elongated torso, a big head bulging on a stocky frame, shoulders stretched to bodybuilder proportions. In the center, the standard man and woman posed squarely. Later, he installed a long white wall lined with cut-outs of distorted icons along a chain-link fence in Providence so that passersby would step through the shadows. Seemingly half-submerged in soil and pitched precariously to one side, the piece is a vivid image of a fallen icon. “The sculpture looks like someone took a big generic stick figure and dropped it out of the sky,’’ said Esther Binstock, 15, of Cambridge, who was wandering through the park on a recent Thursday afternoon. “It’s like a symbol that you see all the time, but in a situation and angle that you don’t normally see,’’ said her sister, Mahalia Binstock, 13. Kornfeld began on a gutted stretch of land in a corner of the park. Then contractors built a foundation of concrete and steel. The whole thing was encased in marine plywood and painted an electric shade of crimson. The end result, which took a week to complete, is stark in its simplicity: all sharp red lines against a lush backdrop of green. Commissioned by the museum and funded in part by a grant from the Nathaniel Saltonstall Arts Fund, “Ozymandias’’ had a budget of $20,000. Kornfeld has constructed other installations with as little as several hundred dollars. He teaches art classes to make ends meet. But the piece is a big step forward for the sculptor. “This is a real star in my constellation,’’ he says. His last piece, a stainless steel knot in Golden, Colo., was a mere 8 feet in diameter. “Ozymandias’’ stands 18 feet tall and is 18 feet wide. Laura Bennett can be reached at lbennett@globe.com.